Town U15s secured their second win of the season over their local rivals Rangers on Friday night with a 4-1 victory in the League Cup at Cheney Park on Friday night. With a comfortable lead at half-time, Town never looked like losing the match. Rangers started brightest with some early pressure, but it was Town who took the lead 10 minutes into the half when Cameron Sands connected well with a corner and flicked the ball home. 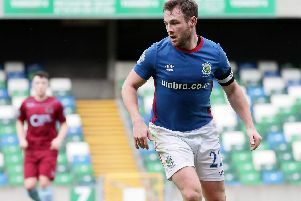 The Blues should have equalised shortly after when their striker rounded ‘keeper Aaron Devlin but his shot found the side netting with the goal at his mercy. This scare forced Town to up the tempo and they stretched the lead when striker Jamie Feeney nodded in a free kick. Both sides could and should have scored with some glorious chances but it was Town who got a third - and what a strike it was. Tom Mehaffey was the man on target when he hit a thunderbolt from the edge of the area high into the top corner. The Gers came out of the traps quickest again at the start of the second half but fortunately for Town they couldn’t convert any of their chances. Aaron Devlin saved superbly five minutes into the half, and at the other end Tom Mehaffey rattled the crossbar with another brilliant effort. Town got their fourth when Shea Winters curled a free-kick into the bottom corner after he had been upended on the edge of the area. Rangers got a consolation 10 minutes before the end to leave the score at 4-1.